Mary W. Dunn received her Bachelor’s of Science in Nursing from the University of Virginia. She completed her Master’s of Science in Nursing at Duke University and is certified as an Adult Nurse Practitioner. Her Master’s program included a sub-specialty in Oncology. Mary joined UNC Urology in 2010 and has served as Adjunct Faculty for the UNC School of Nursing since 2011. Mary works in a multidisciplinary NP role, providing care to Urology and Medical Oncology patients with genitourinary malignancies. She is a member of the Lineberger Comprehensive Cancer Center. Mary is a member of the Oncology Nursing Society (ONS) and the local chapter, the North Carolina Triangle Oncology Nursing Society (NC TONS), and has served on the Board for three years as Community Events Coordinator. 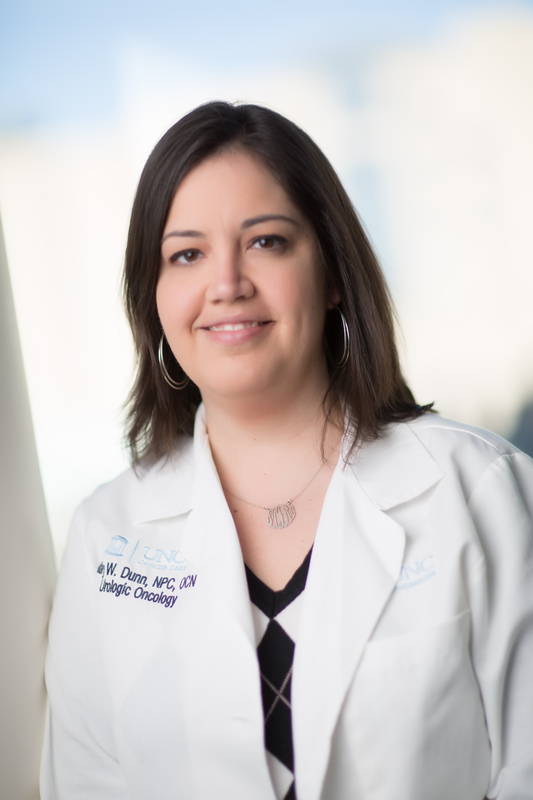 She is also a member of the Society of Urologic Nurses and Associates (SUNA), and the local chapter, Triangle SUNA, and serves on the Board helping to plan the annual local conference. Mary was the first Nurse Practitioner to be invited to attend the annual Bladder Cancer Advocacy Network (BCAN) Think Tank and has attended each year since 2012. She is a member of the Survivorship Working Group, an interdisciplinary cohort that meets annually at the Think Tank and also collaborates on different projects throughout the year. She was one of the founding members of the North Carolina Triangle Chapter of BCAN and proudly serves on the Board as Secretary. Cancer Survivorship is one of Mary’s clinical interests, and she was honored to be chosen to attend a three-day NCI-funded program in October 2013, “Preparing Professional Nurses for Cancer Survivorship Care”, presented by the City of Hope and Memorial Sloan Kettering Cancer Center. Mary plans to use the tools that she learned at this intensive conference to educate nurses about survivorship issues pertaining to patients with GU malignancies and to help establish a Prostate Cancer Survivorship Clinic at UNC. She also gave a keynote lecture at the 2014 North Carolina Cancer Survivorship Summit titled, “Uncertainty in Cancer Survivorship”, and facilitated a group session titled, “Male Sexual Dysfunction in Cancer Survivorship”. She currently coordinates the monthly Testicular Cancer Survivorship Clinic and the Von-Hippel Lindau Clinical Care Center. Other interests include sexual health in cancer care, providing best supportive care in advanced malignancies, and educating the public and healthcare providers about the role of Advanced Practice Providers. Medical professionals interested in referring a patient please visit our Refer a Patient page for more information.